Lose Weight While Watching TV! One of the main reasons people say they cannot fit in exercise is that they simply do not have time. This is a common complaint and not an excuse to be sniffed at. It is normal for working mums’ and dads’ to only get time to themselves late in the evening, and it would take an awful lot of motivation to head out exercising when you just want to sit and relax. 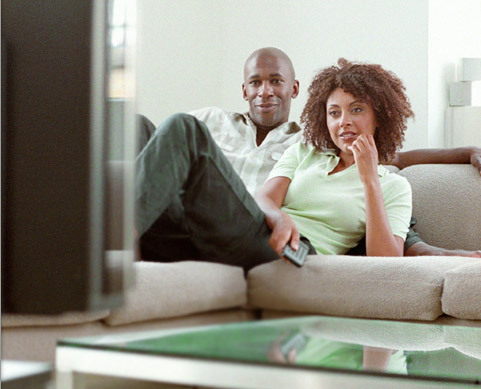 After a long day at work or minding your children, most adults want to sit down in front of the tv and unwind. Well, what would you say if I told you that you can do this, and also fit in some exercise? We all seem to forget that there is an ad break of at least 3 minutes every 15-30 minutes when we are watching normal TV. This is the perfect opportunity to fit in a mini workout. On average, adults watch 4-5 hours of television a day, mostly in the evening. Whether you watch more or less than this, you could be racking up at least 1 hour of exercise while the ads are on. These three minute intervals make reaching government recommendations for exercise much easier than heading to the gym for an hour. It is recommended that adults amass 30 minutes of moderate intensity exercise most days of the week, so if you can get moving during the ad breaks you can easily meet those recommendations. Just think, you can meet or even surpass the recommendations easily while sitting in front of the television. There are plenty of exercises that you can do during the ad breaks according to your own exercise goals and preferences. I have compiled a list of 10 quick and easy exercises but you can add in your own according to your own ability and preferences. I would recommend to do either one or two of the exercises at each ad break, so that gives you either 1.5 or 3 minutes per exercise. This is a great way to build up a little circuit that you can complete each night. If you’re feeling energetic , there’s nothing to stop you continuing your workout when your programme comes back on. I actually find it easier to continue when I have the distraction of the soaps. You can use your own weights or any household objects e.g. tins of beans or large bottles of water as these can work for weight exercises. You could put down a mat or rug onto the floor for your tummy exercises so that you make sure not to injure your back. As always, you should check with your doctor before embarking on a new fitness routine if you have any health concerns. Hopefully within the 10 exercises listed here you will find at least 5 that you are able to complete. Possibly not for those who live above others in an apartment complex. Holding a weight in your hand and slowly curling your forearm towards your shoulder. Plant your hands firmly on a chair behind you, about shoulder width apart, and slowly lower your body down to the floor. You can bend your knees to make this easier. Sit with your back flat to the floor with your hands at your temples, raise your knees up off the ground. Perform the exercise by bringing your opposite elbow to your opposite knee in a lateral movement. Sit with your back flat to the floor and your knees upright with feet flat on the floor. Slowly bring your torso towards your knees, tensing your stomach muscles. Place your hands on your hips and make an exaggerated but controlled step forward on one leg. Return to start position and repeat with the other leg. Lie flat on your stomach and place your hands flat on the floor, about shoulder width apart. Raise yourself up so that your elbows are at right angles and then lower yourself back down. You can do this with your knees bent to make it easier. If you have a kettlebell you can work through your recommended exercises. Stand with your feet shoulder width apart and hold both arms out straight in front of you. Lower your body down (as if about to sit into a chair) until you feel your stomach muscles tighten, and hold this for 5 seconds. Repeat.